At the end of the summer, the leaves should have done their job; that of making sugars to be used in growth, the formation of new twigs and branches, forming fruits and seeds. However, winter is not conducive to photosynthesis or growth; winds, low temperatures and low light intensities adversely affect a tree's ability to make sugars. In fact, leaves can be viewed as a 'liability' and if retained throughout the winter, they would use the reserves the tree has stored away in the Spring and Summer. Leaves would also offer greater resistance to the wind and the tree would be more likely to suffer damage - the breaking of branches or indeed the toppling of the tree. High winds are always more dangerous to a tree when it is in full leaf. 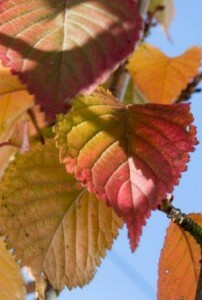 Leaf fall is associated with changes in the colour of the leaves. 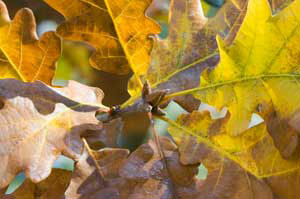 The green of the chlorophyll is lost and a variety of other colours come to dominate - reds, oranges and yellows. These colours are associated with other pigments, the carotenes, xanthophylls and the anthocyanins, the latter combine with sugars to give a red colouration (like in an ripening apple). Some trees have particularly bright autumnal leaves, such as the Maples. "The Fall" in New England is often spectacular. As the chlorophyll disappears and the leaf no longer makes sugars so changes at the base of the leaf stalk (petiole) take place. Here, the cells begin to 'round up' and begin to lose touch with each other. The cement between the cells begins to weaken - what is termed an abscission layer forms. This layer stretches across the base of the leaf stalk so that the leaf has nothing securing it to the plant. Sooner or later, the leaf by virtue of its own weight, or hastened by high winds or frost - falls. The cells of this abscission layer are corky so that when the leaf falls, no living cells are exposed to the elements but a leaf scar is formed. 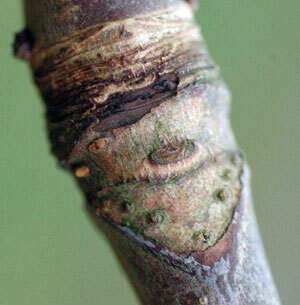 Leaf scars often have a distinctive shape and form. Well, it depends on what you want to know. i really need to find out how you get facts about leaves?!? When the woodland wind blows ….